Gotta love when a card comes together rather quickly when using a sketch! Today's card uses SC230 from Splitcoast, and the DoodleFactory Oh Baby! Set and Sentiments from Starving Artistamps. If you've clicked on the SAO Widget and donated to Stamping Out Alzheimer's, you have a chance to win this set, along with the DoodleFactory Super Parents, as it's one of today's giveaways over at SOA. My focal image was colored using the Marker Watercoloring Technique and the Out of the Box Technique. The beautiful paper is Parisian Breeze from Stampin' Up! - currently on special until May 31st - email me today to order yours! On the panel behind my focal image, I used the Big Shot and the CuttleBug Distressed Stripes Folder to add some texture. I used a SAMJ to stamp "baby" from the Baby Sentiments. 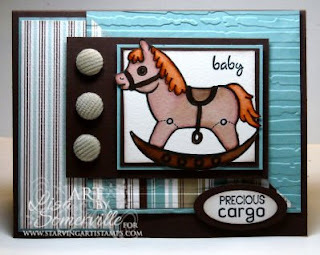 Precious Cargo is stamped in Black on watercolor paper, punched with the small oval, then layered onto a large Chocolate Chip Oval.